Dr Vikas Mittal looks young but has about 10 years' experience in field of Pulmonary Medicine. His strengths include being meticulous, diligent and academic. He is very dynamic but at the same time humble and down to earth, so easily approachable. He has good clinical expertise in dealing with all kinds of pulmonary diseases and is well versed with all major diagnostic and therapeutic pulmonary procedures, having done about more than 1000 bronchoscopy/interventional pulmonary procedures. He is also involved in research work related to pulmonary diseases. He is a strong believer that practise of medicine is "an art as well as a science" and so always honestly practices evidence based medicine but with a practical and human touch [sevabhav] with utmost human ethics. He is a product of the most prestigious medical college of Delhi, Maulana Azad Medical College and did his post-graduation [MD]* in Pulmonary Medicine from the best Chest Institute in India, Vallabhbhai Patel Chest Institute, Delhi. He has a unique blend of professional experiences, having worked as a senior registrar at both government set up at LRS institute of TB and chest diseases, Delhi and at private sector at Sri Balaji Action Medical Institute, Delhi. He also has a research aptitude, having worked as a research associate at VP Chest Institute for 1 year before joining Max Healthcare Ltd where he is working with 7th year in running. He am currently a Consultant in Department of Respiratory Medicine at Max Super Specialty Hospital, Saket, Panscheel Park and Shalimar Bagh, having independent charge of OPD and inpatients since Oct. 2012. He is well verse with the American System of Medicine and patient care, having certification from the Educational Commission for Foreign Medical Graduates, (ECFMG) from USA and having done a month of observership at Department of Pulmonary and Critical Care Medicine, St Francis Hospital, University of Connecticut, USA. 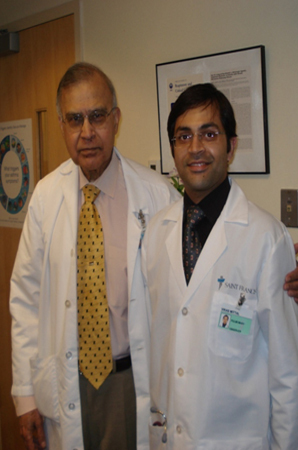 Training in Sleep Medicine- He had completed a Mini Fellowship in Sleep Medicine at Emory Sleep Center, Atlanta, USA in June 2011. He was among the 10 International Scholars from all over the world sponsored by American Academy of Sleep Medicine (AASM) for this fellowship at AASM accredited centers at different parts of US. He had an opportunity to do a Philips-IISS certificate course (8 days) in sleep medicine at Mumbai, followed by short term (6 months) training at sleep laboratory at AIIMS, Department of Neurology. He is mong of the first few candidates who were certified by Indian Board of Sleep Medicine in 2012. Training in pulmonary rehabilitation: At Vallabhbhai Patel Chest Institute, University of Delhi, India and at St. Francis Hospital and Medical Center, University of Connecticut, USA. He has 4 international publications as first authors and 2 national publications, 3 oral and 5 poster presentations at various national and international pulmonary conferences and involved in many such academic activities. In 2 of which he had received prizes, one of which was "Dr. J.C. Kothari Young Scientist Award" (as First Prize) from Indian Chest Society. He was a faculty at the "Max Critical Care Nursing Course" and was also a faculty at the "Sleep Technician Training" course at the National Sleep Medicine Course held recently at NIMHANS Bangalore, December 2012. He is reviewer for journal "Lung India" and a regular attendee of national and international conferences, CME's and workshops and member of various scientific societies. 1. Vikas Mittal, Ashok Shah. Subjective symptom perceptual accuracy in asthmatic children and their parents. Oral presentation at the National Conference on Pulmonary Diseases, NAPCON 2005, Science City, Kolkata,India November 16 – 20, 2005. Received "Dr. J.C. Kothari Young Scientist Award" (as First Prize) from Indian Chest Society for the above mentioned paper presentation. 2. Vikas Mittal, Ritu Kulshreshtha, Animesh Arya, Pramila Bajaj. Acute fibrinous and organizing pneumonia presenting as complete lung consolidation. Oral presentation at the international Conference on pathology of Chest Disease, 2008, VP Chest Institute, Delhi,India. December 6-7, 2008. Received second prize for the above mentioned paper presentation. 1. Eema,Lall A, Kishore N, Abrari A, Shelly S, Mittal V, Sharma T, Rani U, Sharma S. Antharcofibrosis: an often missed yet important diagnosis. International conference on the 'Pathology of Environmental lung Disease and Workshop on Transbronchial lung biopsy interpretation', held at VP Chest Institute, Delhi, India, on November 2010. The poster won 1st prize. 2. Mittal V, Kishore N, Aneja A. Excessive dynamic airway collapse: an often missed diagnosis in a wheezy patient- presented the same personally. 16th Annual National Conference of Indian Association for Broncology; Broncocon, held at Chandigarh Delhi, India, on February 2011. 3. Eema, Kishore N, Mittal V. Unusual and fascinating findings in a case of bilateral large fibro-calcific lesions16th Annual National Conference of Indian Association for Broncology; Broncocon, held at Chandigarh Delhi, India, on February 2011. 4. Aneja A, Kishore N, Mittal V, Anand AK, Chaudhoory AR, Punnakal A. An unusual case of double catheter endobronchial brachytherapy in a case of recurrent non small cell carcinoma. 16th Annual National Conference of Indian Association for Broncology; Broncocon, held at Chandigarh Delhi, India, on February 2011. 5. Mittal V, Kishore N, Abrari A, Kumar A. Diffuse aspiration bronchiolitis diagnosed on transbronchial lung biopsy in a case of thymoma with dysphagia. Thematic Poster Session entitled "Respiratory manifestations of systemic disease: a holistic approach" at the ERS Vienna 2012 Congress. 1. Mittal V, Khanna P, Panjabi C, Shah A. Subjective symptom perceptual accuracy in asthmatic children and their parents in India. Ann Allergy Asthma Immunol. 2006; 97: 484-489. 2. Mittal V, Kulshreshtha R, Arya A, Bajaj P. Acute fibrinous and organising pneumonia presenting as complete lung consolidation.Singapore Med J. 2011; 52: e88-90. 4. Mittal V, Lloyd SM, Collop N. Polysomnography and Implantable Cardiac Devices: Identifying Normal and Abnormal Paced Beats. J Clin Sleep Med. 2012; 8: 340-42. 1. Kishore N, Chaturvedi H, AnandAK, Mittal V. "Y" stent the trachea for an esophagealtumor? Max Medical Journal 2010; 5: 3-5. 2. Chhabra SK, Vijayan VK, Rahman M, Mittal V, Singh PD. Regression equations for Spirometry in Children aged 6 to 17 years in Delhi Region. Indian J Chest Dis Allied Sci 2012; 54: 59-63.